SUCCESS!! You are Enrolled in the 6-Week Quit Fighting with Food Course! I want to personally congratulate you for investing in yourself, your health -- and your life! You are about to embark on a life-changing course that will have a positive impact in every area of your life! 1. You will get an email from me (peghall@cox.net) in the next 30 minutes, with details on how to access all the online videos and phone calls, with the dates and details. 2. You will get a special gift from me starting tomorrow, and continuing until the program officially begins on Monday, June 18, 2018. 3. If you were one of the first 10 people to enroll, you will also get details on how to arrange your personal, individualized coaching 20-minute phone call with me. 4. You can email me for questions about the program here: peghall@cox.net. 5. 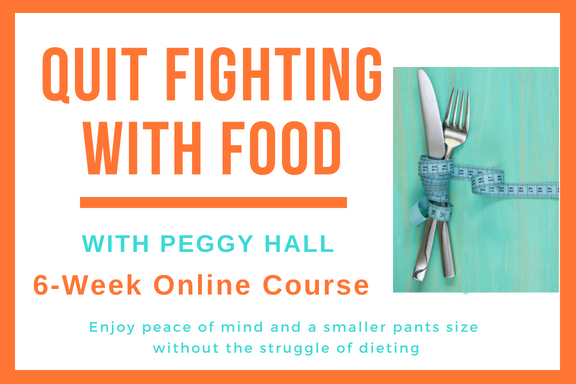 Stay tuned -- can't wait to see you in the 6-Week Quit Fighting with Food Online Course! ~ You are Awesome, and I'm so glad you are investing in yourself at this time. You deserve it! Follow-Up Phone Call #1: Thursday, June 21 5:00-5:45 pm Get your questions answered, along with additional support and guidance to help you sail through the weekend with confidence and ease! Follow-Up Phone Call #2: Thursday, June 28 5:00-5:45 pm Get your questions answered, along with additional support and guidance to help you sail through the weekend with confidence and ease! Follow-Up Phone Call #3: Thursday, July 5 5:00-5:45 pm Get your questions answered, along with additional support and guidance to help you sail through the weekend with confidence and ease! Apply the "Power of Positive Eating"
Follow-Up Phone Call #4: Thursday, July 12 5:00-5:45 pm Get your questions answered, along with additional support and guidance to help you sail through the weekend with confidence and ease! Live Video Class #5: Surviving Sabotage -- from others -- or yourself! The #1 word that will silence the food-pushers forever! Follow-Up Phone Call #5: Thursday, July 19 5:00-5:45 pm Get your questions answered, along with additional support and guidance to help you sail through the weekend with confidence and ease! Learn how to be confident in taking action -- even before you think you're ready! Share your gifts with the world -- you do have them, and they are valuable and needed! As soon as you complete your registration, you'll get a special message from me of encouragement and support! You'll also get a special DAILY bonus from me from now until the QFWF online course begins on June 18, 2018 so can get started right away. "Peggy, I wanted to tell you to date I have lost 32 pounds and have gone several sizes. I have not had a craving for sweets or junk food. Our church had a ladies retreat with a Chocolate Boutique. There were chocolate kisses, chocolate desserts, and a chocolate fountain on display. I used to be a Chocoholic, but I was able to resist and I didn't even want any. "Treat yourself well-you deserve it!"